Today marks the end of my Mint Julep week and you’ve still got a little over three hours to get ingredients if you’d like to enjoy a couple before the start of the Kentucky Derby. What’s my verdict? This cocktail is good, but not something I’m going to find myself craving. Were I to attend the Derby I would certainly partake of one (or several :). I won’t, however, be mixing these up regularly. I simply didn’t find the Mint Julep to be all that exciting. The sugary bourbon concoction reminded me of an Old Fashioned without the addition of bitters, which to my mind make the Old Fashioned delicious. Where the Mint Julep shines though is in it’s use of a mint sprig as a garnish. Don’t for a second think that the mint is there purely for decoration. Rather, it is an integral part of the cocktail experience. Key to this is forcing the consumer to bury their nose in the mint for each sip of the cocktail. This increases the mint quotient exponentially. The mint should be lightly rubbed or clapped between your hands before garnishing. This will open up the mint and allow for a stronger mint aroma. In my searches and experimentation with this cocktail there seem to be three primary schools surrounding muddling. 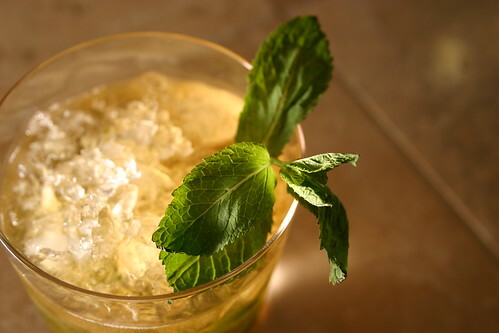 Light Muddling: Add simple syrup (not granulated sugar) to a glass with the mint. Then gently muddle the leaves to encourage them to express their oils. If you’re breaking up the leaves with your muddling you’re doing it too hard. Once muddled add your bourbon and ice, then stir to chill. I found that of the two muddled preparations this one was much more visually pleasing. The resulting drink is lightly minty and the mint leaves remain large enough that you won’t be sucking them up your straw. This method would definitely be my choice for one off Mint Julep making. Hard Muddling: Add granulated sugar to a glass with the mint and a dash of water. Muddle until the mint is broken up and the sugar has dissolved into the water. Then add your bourbon and ice, stirring to chill. This technique works fine if all you have on hand is granulated sugar. However, I found two problems. One, when muddled in this way the mint can break down to such a degree that you end up with a bitter flavor from the chlorophyll. Two, I don’t enjoy tiny bits of leaf floating in my cocktail. The mint is broken down so much in this preparation that you would definitely end up with bits getting sucked up your straw. Assuming you haven’t gotten to the bitter qualities of the mint the resulting drink is still nicely minty and interestingly not that much more minty than the lightly muddled version. No Muddling: This preparation requires that you make up some Minted Simple Syrup using the recipe I posted earlier in the week. To prepare the cocktail add your desired amount of Minted Simple Syrup along with your bourbon and ice to a glass. Stir to chill and top off with more ice if you like. This is definitely my preferred preparation and the one I would use were I making this cocktail for a Derby party. There are no mint bits to get sucked up and the resulting drink is still nicely minty from the infused syrup. At this point there is one final level of easy preparation you can go to. You could buy premade Mint Julep mix. This is basically bourbon that already has the sugar and mint flavor added. Simply pour over ice, stir until chilled and garnish with fresh mint. A few of the high quality bourbon makers also have this available, particularly around Derby time. While I didn’t get a chance to try any of these this go round, I think they could be a good option for a party. While each of these methods results in a tasty cocktail, I’ll repeat myself that the absolute key is the addition of the fresh mint garnish. This simple addition elevates this drink to a higher level. A final note before I list my recipe. The amount of sugar called for in most of the recipes was too much for my taste. That in mind, this drink is supposed to be sipped over a long period of time and would, therefore, become more and more diluted as the ice melts. So, take my recipe with a grain of salt. Modify it as you see fit and enjoy your Mint Juleps.